Well...it's with a great deal of sadness that I have to report the closing of Wind Dancer Garden at the end of this month (November 30). A few weeks ago, owner Carolyn Kolb emailed me to let me know they were closing. She and her husband, Larry, had decided to retire...so after 12 years, were closing the nursery. I was actually out on the Oregon Coast near Astoria at the time with Norm and his mom, and got the email just as we were heading home. As we drove through the mist and rain at twilight along the Columbia river, I had lots of time to think about the news. Of course, I was happy for Carolyn & Larry...after all, running a nursery is A LOT of work...and is a huge commitment of time and energy. On the other hand, I couldn't help but be saddened by the news. After all, my Autumn excursions out to Wind Dancer had become a bit of an annual event for me (and whoever I could get to go along)! 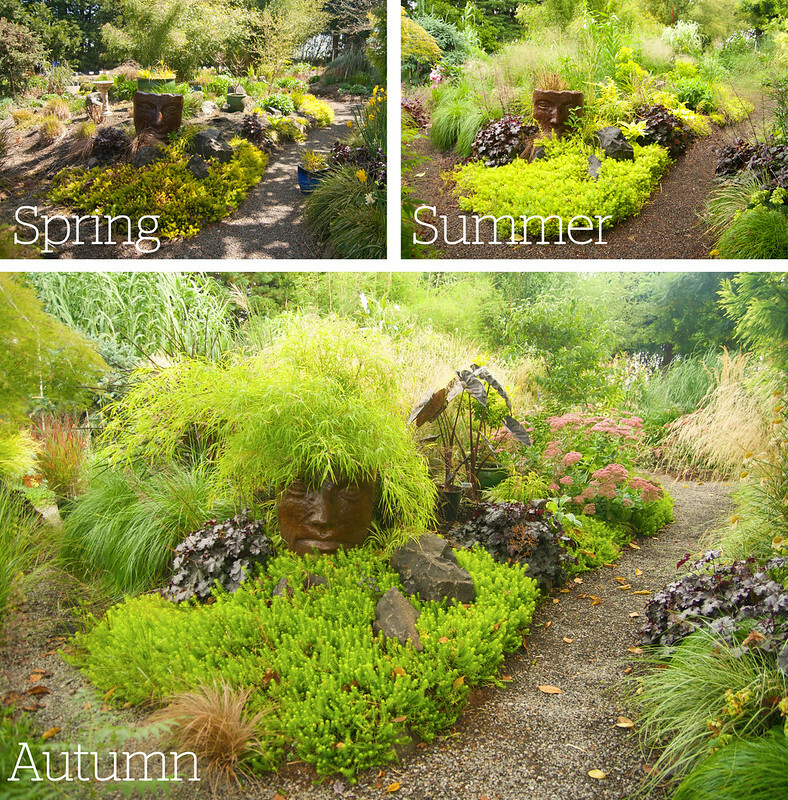 Over the past few years, I've really looked forward to these visits with great anticipation, not just because of all the wonderful plants I wanted to buy...but because I loved talking with Carolyn, and wandering about her wonderful display gardens. 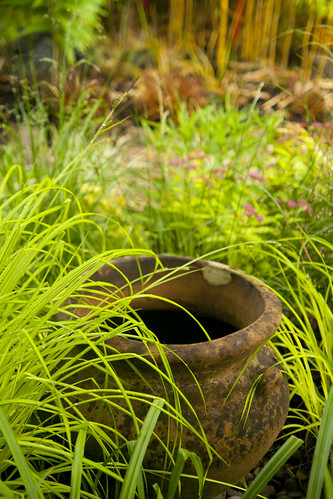 If there's anything that gardening teaches us, however, it's that nothing is constant...change is inevitable. The seasons march on, and no amount of hand-wringing on our part will stop that. This isn't a mopey post, however, but a celebration of just how great Wind Dancer was (and IS)...and how much I (and I'm sure many other gardeners) have taken away from it. Most of these pictures are actually from an early-summer visit earlier this year...so the garden will look quite different from my other posts! 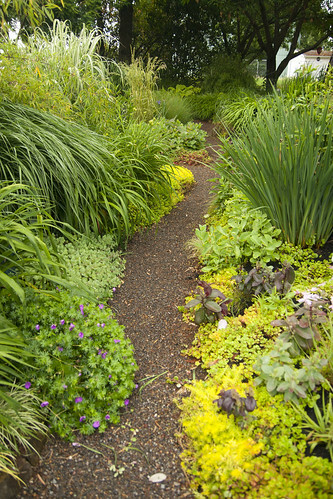 One of the things I love most about the gardens at Wind Dancer is that many of them are raised, edged with flat rock. 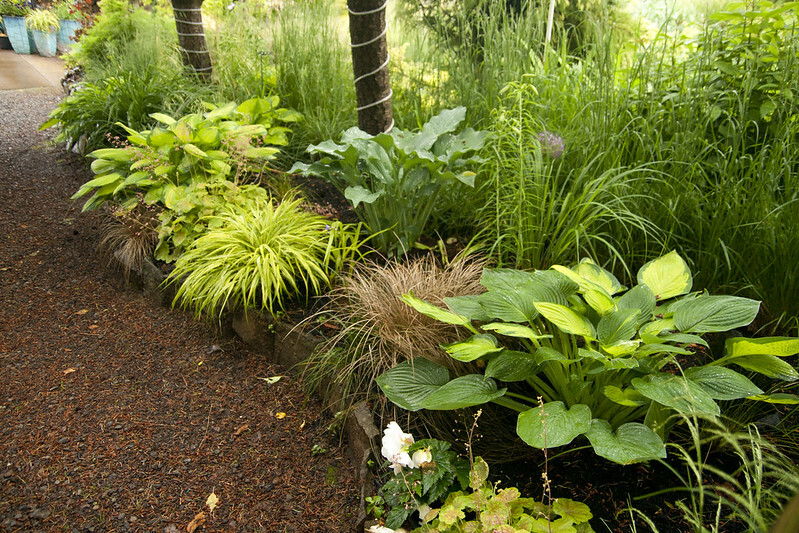 This helps to give grasses good drainage...a definite plus in winter-wet Oregon! 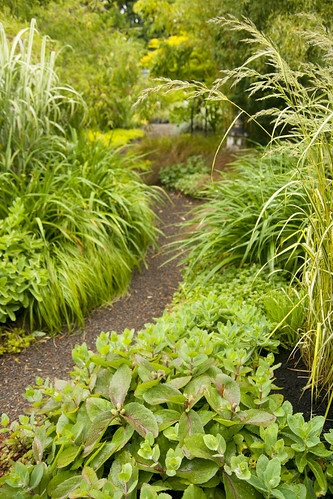 Wind Dancer was also one of the first large garden spaces I ever visited that used gravel extensively, both as pathway and mulch. I love this look...it's so wonderfully simple and informal...no pretention here. 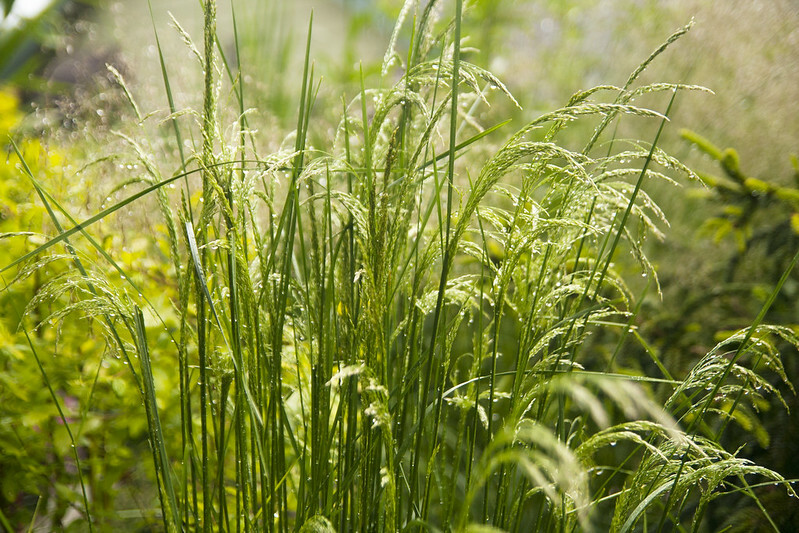 I also credit Carolyn (and fellow blogger Heather, of Just a Girl With A Hammer) for waking me up to the beauty of Deschampsia. How could I have looked at such a sight in the past and not marveled at it's subtle beauty? One of the effects that they have achieved at Wind Dancer that I utterly adore is this feeling of enclosure. You walk through these enormous, towering plants...and feel so surrounded, so utterly dwarfed...it's amazing, especially when you realize all this growth occurs in a single season (not counting the Maple, of course)! Gotta love this shrub (Spirea, I'm guessing). More gracefully curving paths...they seem to have really mastered the art of the curving path at Wind Dancer. I love how lush the plantings are, growing right up to and spilling over the paths, making them seem less man-made and more like worn foot-paths winding through a meadow. 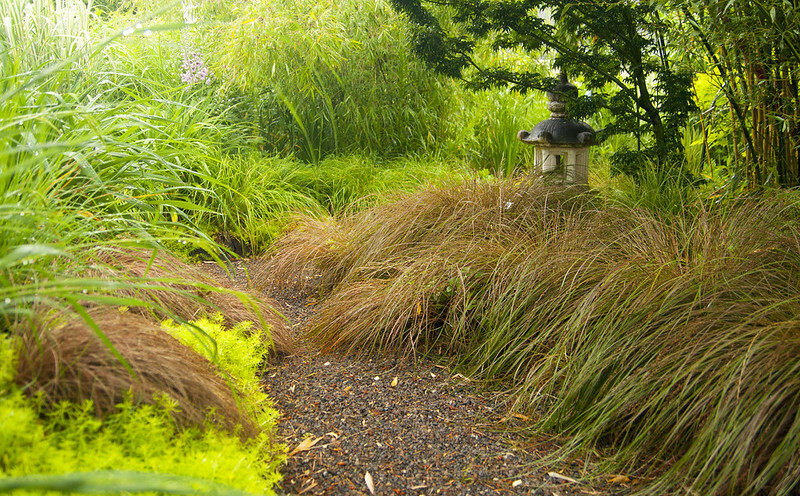 More seductively curving paths amidst towering, lush grasses. 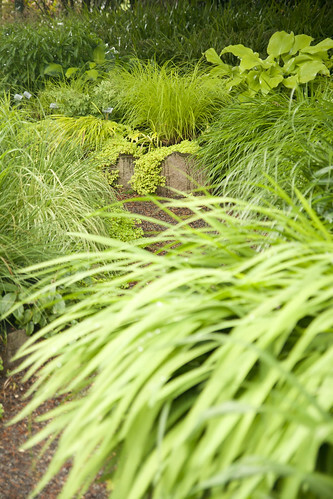 I love the effect of having the area around the curve of the path hidden by taller plants...beckoning us onward. 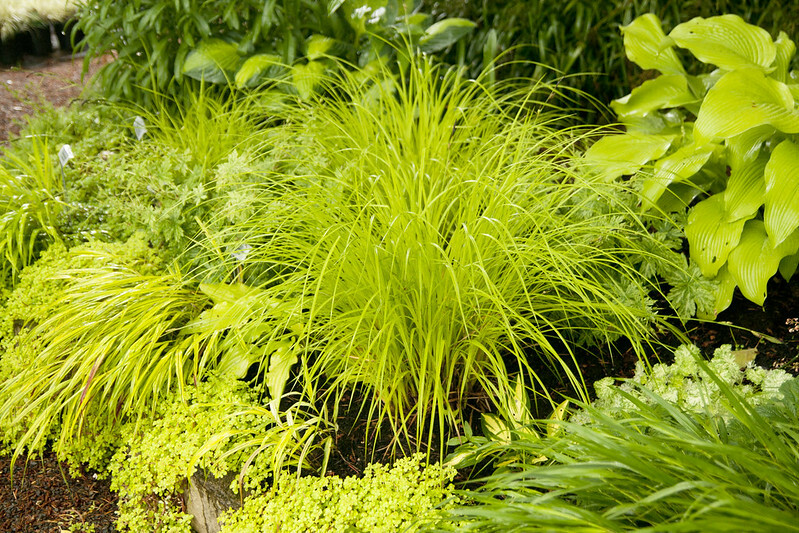 Sedges, grass relatives, come is such a rainbow of colors. 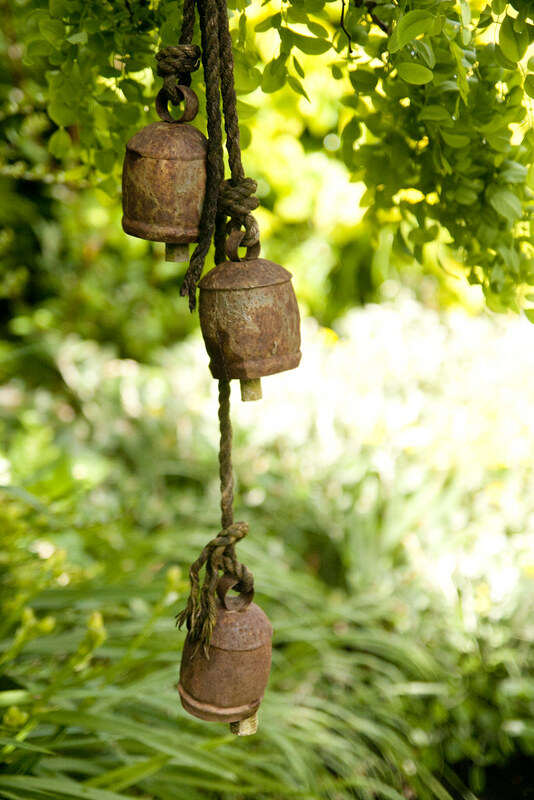 Objects are placed very thoughtfully and sparingly around the garden...again, careful, tasteful...avoiding the feeling of being a curio cabinet of Tchotchkes. You know I love me some rusty metal! 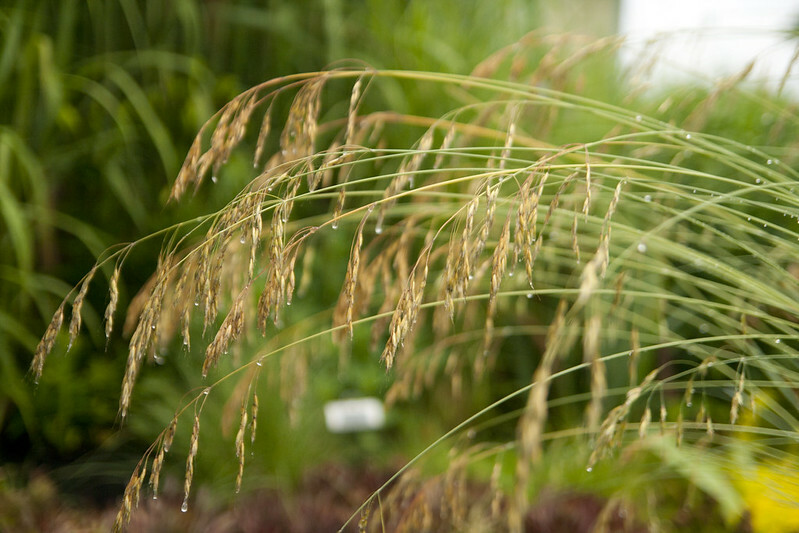 The garden here is a great way of appreciating how amazing grasses are in their reaction to environmental conditions...even a slight mist can weigh down their tall tassels. 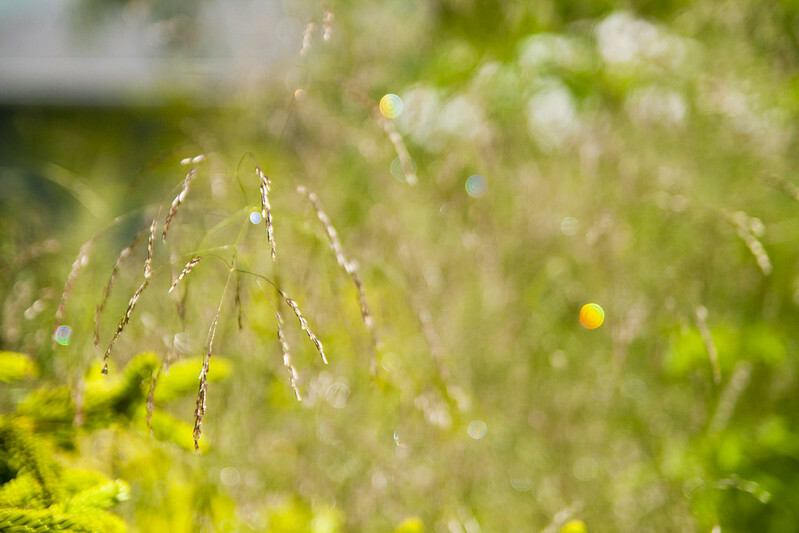 That same mist is captured by the blooms...studding them like so many jewels. When the sun re-appears, they fluff back up into a billowy cloud. 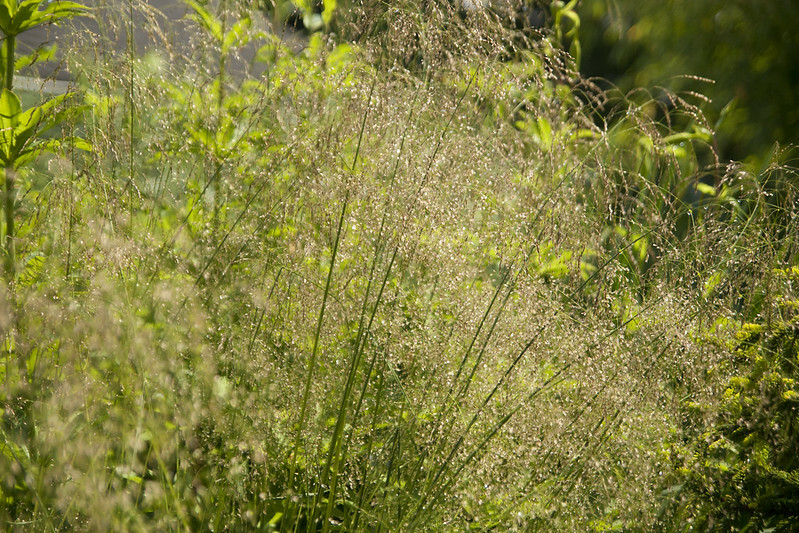 Visiting during early summer, as I did here, shows Calamagrostis 'Karl Foerster' in it's pink tassel phase, after they have contracted from their puffy flower phase. In a few weeks, they'll dry and turn gold. It's always rare to find someone who you feel is a bit of a "kindred spirit"...and I think those of use who really love grasses all feel that way toward Carolyn & her husband. Her enthusiasm for gardening was evident in her demeanor...and, of course, sincere enthusiasm is always a bit contagious! I'll always be grateful for getting to know both of them, and, of course, getting to visit their wonderful garden & nursery. 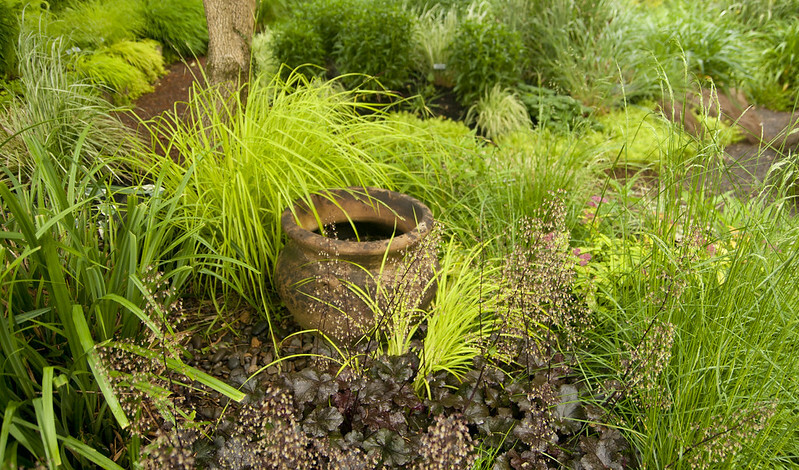 As I was preparing this post, looking at photos, trying to figure out what to say, it struck me just how MANY plants I had in my garden from Wind Dancer! 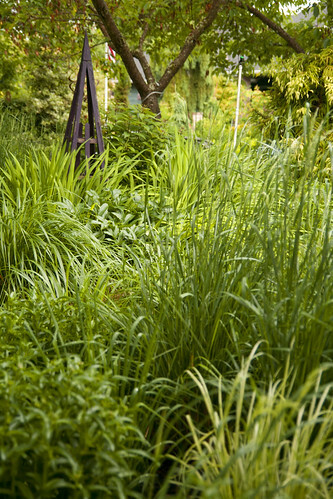 Above, you can see just a few grasses I bought from Carolyn over the past few years. Needless to say, even after closing, both the plants in our gardens and the inspiration provided by Carolyn & Larry will endure for quite some time. 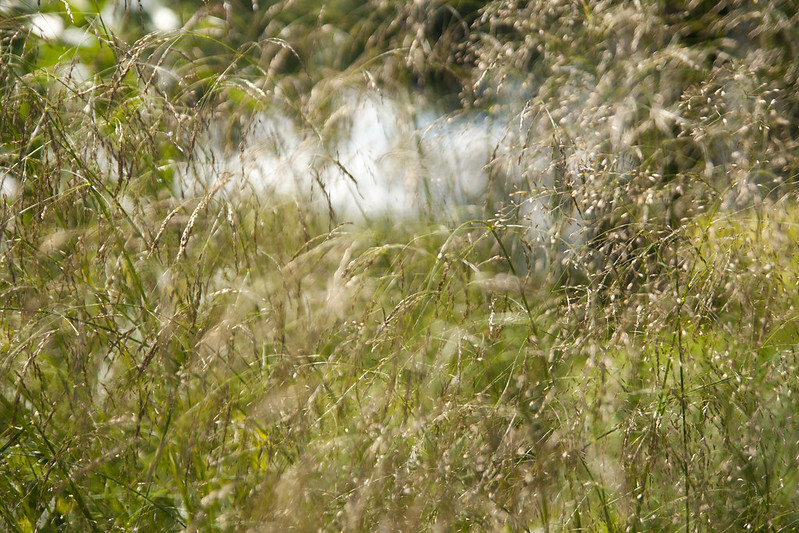 So, for all you grass lovers out there, they are open until November 30, so give them a shout (they are open by appointment only) and go before it's too late...I know I am! It does look like a wonderful nursery. Absolutely nothing like that around me (I only wish). When I first say your post title in the Google reader, I thought you had had a snow, and it had crushed your grasses. That happened here last night, and it flattened a lot. But that's the nature of gardening. Constant change. Oh no...I'm so sorry, James :-( I remember last winter, the grasses stood for soooo long, then, late during winter, we got a really wet, heavy snow and they were totally flattened. 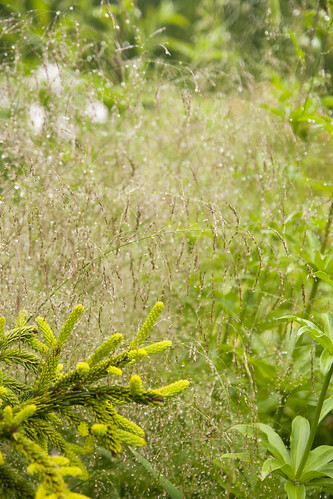 You're so right though, it's the nature of gardening...still, we can't help but be saddened that you won't get to enjoy those wonderful winter effects the grasses give. So sorry the nursery is closing, but hooray for retirement. You have profiled them very nicely, I especially like the three season photo. What a great show of growth over the year. Exactly! I can only dream of retiring someday...so I'm very happy for them! I'm really sorry to hear of their closing since I've enjoyed every post you've written about this beautiful nursery. But yes, life does go on, and good for them for being able to retire. Maybe a kindred spirit will come along and buy it from them! In any case, I also enjoyed the wide view of your corner garden, Scott. Very nice! Do you need help robbing a bank? I really want you to do this! Hahaha...a bank robbery would be a good start! So very true, Kacky...it's so great to look out at my garden and see all the treasures I've brought back with me over the years! Sad to learn we're loosing a great Oregon nursery, glad to hear they are retiring though. Do they live on the premises? If so that probably makes selling the nursery a little complicated huh? Not that this is exactly a great time to try and find a buyer. It's so true, Loree, we are so lucky to have all these great independent nurseries...and it's very sad to have any of them close. They do live on the grounds (they have a much larger garden that wraps all the way around the house). I'm not sure how they'll do it...but they are maintaining the display gardens as their own gardens, I believe. Just a lovely blog post! I hope the owners continue to relish their grassy property upon retirement! And I hope you will continue to treat us to yours as well. I believe they are, Marie...can you imagine walking out to that every day...pure bliss! Sad! There's no other grass nursery in our region now... what will we do? I know, Kate...I'm a tad distraught...I guess now I have no choice but to open my own nursery (won't Norm be pleased)! Such fabulous photos you've posted. A bit sad about the retirement; my local family owned garden centre owner retired and shut down this year, very sad as I loved going there. The photo at the end is such a great idea for doing up a garden plan from a photo(s). I'll have to try that. I can totally relate...it's always so sad to lose something you've come to enjoy so much...I wish them a happy retirement, for sure! What a beautiful tribute to the nursery! Losing good independent nurseries is never a positive for the plant collecting gardener but hopefully it will be a positive for the retiring owners. Even better if the garden will be preserved. 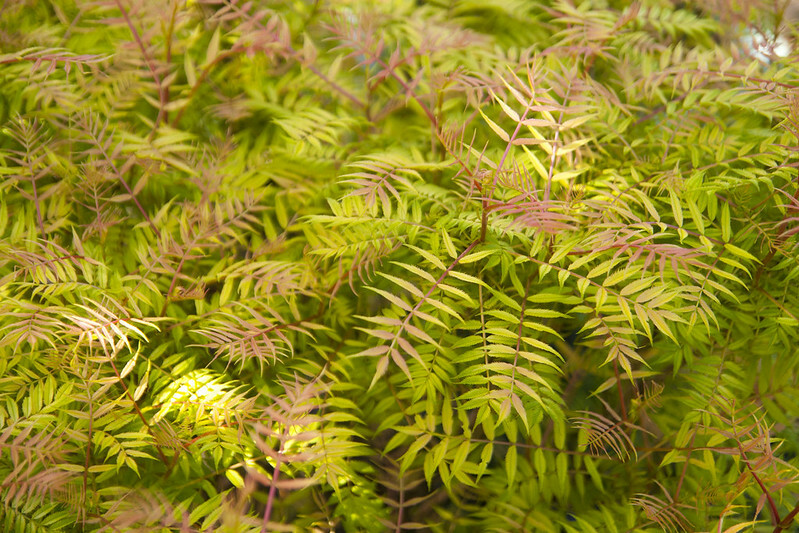 BTW, I believe the unknown shrub you have guessed to be a Spirea is Sorbaria sorbifolia. Beautiful emerging foliage but can be a pest as it suckers. Ahhh...you're right...I knew I wasn't right on that shrub...I should have looked it up!!! Agreed...it's sad for us...but ultimately, happy for the owners! What a beautiful place--sad news indeed. And I LOVE chartreuse in the garden too! It's always a sad day when a good nursery closes. 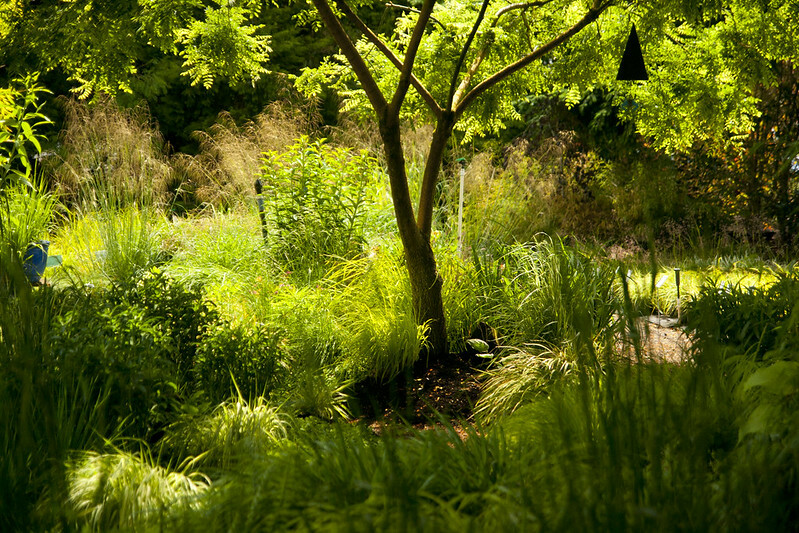 You've shared some gorgeous images of their gardens. Glad they will keep the gardens going even though they are retiring. The closing is a real loss, I would be saddened as well. Unfortunate that the economics makes it so difficult for someone else to come in and take over. For real, Jason...it's such a tough time right now. How sad when a great nursery closed. We have had that happen manytimes in my area because of the economy. I really miss how many choices we used to have. 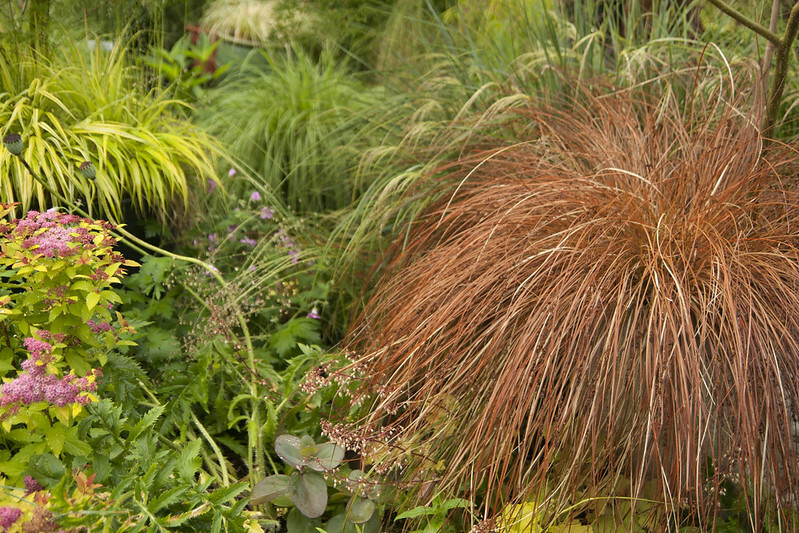 I love all of the grasses annd the combinations, texture, etc. It really is sad to see any local nursery close, especially those that offer something unique. So their garden and their influence lives on--in your garden and those of all the other folks who purchased and planted their offerings. This is a sweet tribute. 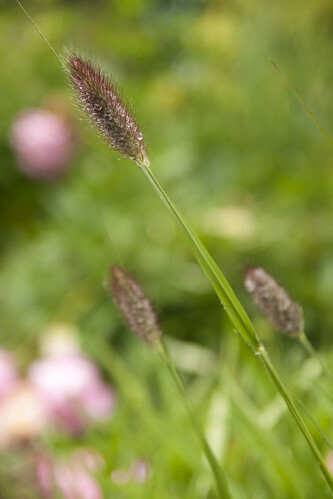 Grasses, all plants, nurseries, gardens, friendships, people, life itself so fleeting. The ephemeral nature of it all makes finding a little joy in some moments truly special. Celebrating the moment of Wind Dancer and its influence is bittersweet. I'm glad you were able to enjoy W.D. for a time and very happy for retirement! Exactly...I think it is a metaphor for all of life, really...as sad as it can be. Hahaha...believe it or not, I'm totally allergic to marijuana plants (seriously...well, at least their pollen)! 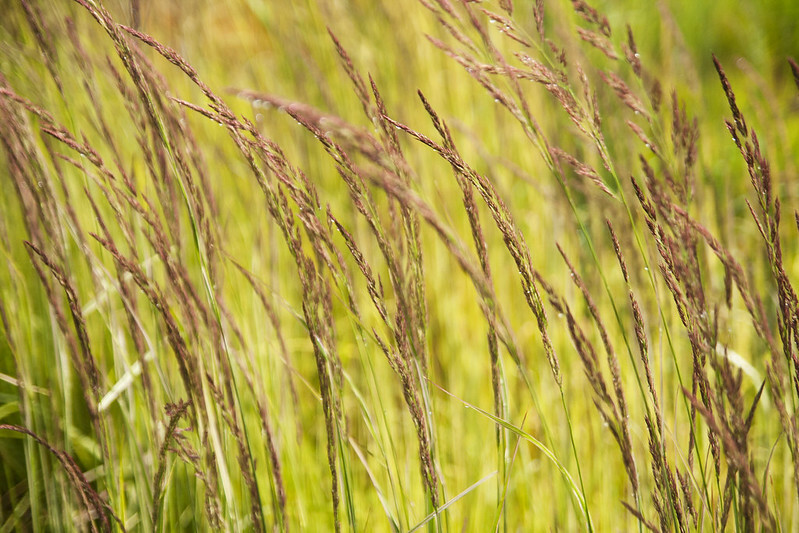 The grasses look so beautiful in your photos or when they are in someone else's garden. That is because here in the tropics they can't be trusted like that! 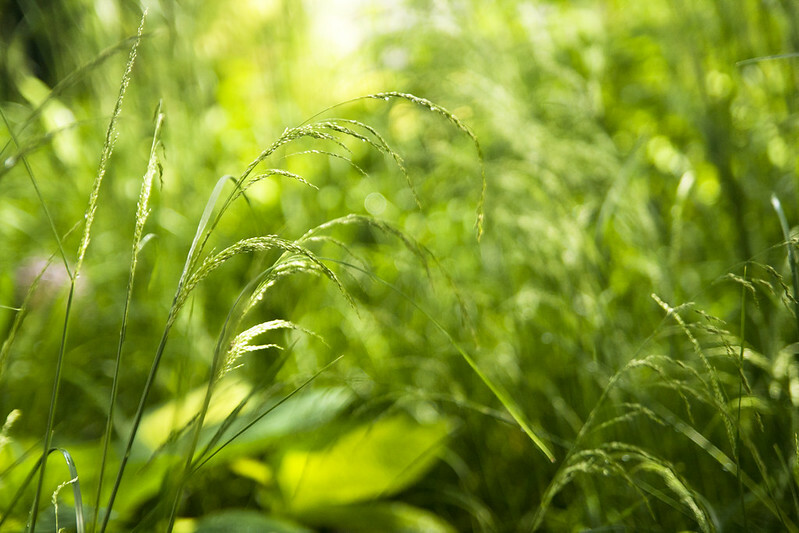 After a season your areas and beyond will be fully conquered by these grasses. In your case thanks to your winter, they are not able to invade and be colonizers! 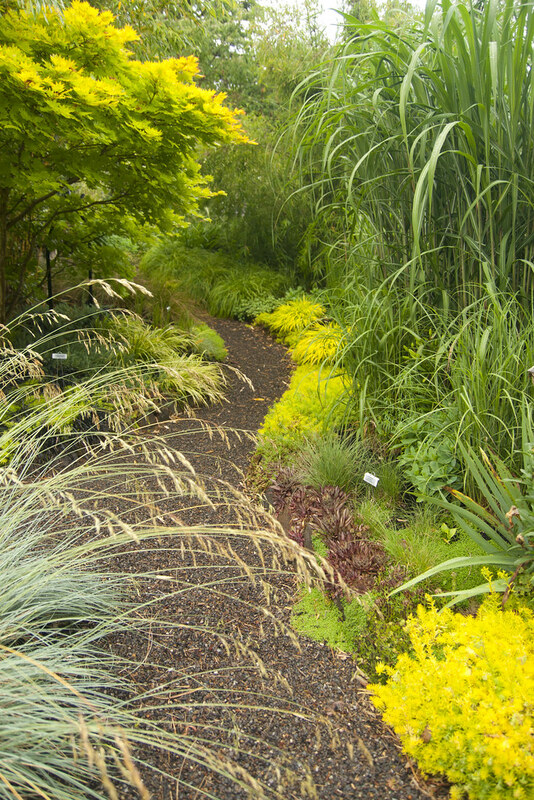 I have always loved the name of that nursery: it so precisely captures the spirit of grasses. Now you have captured the spirit of the nursery in words and pictures for a great send-off. 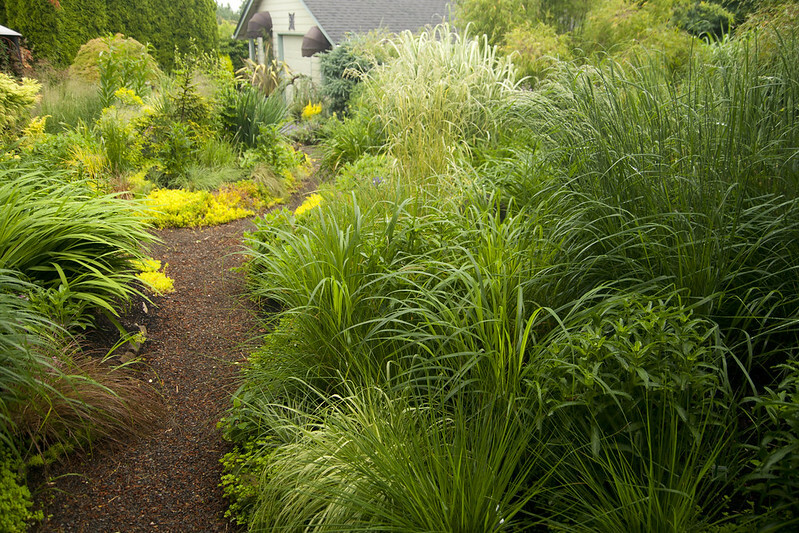 You garden looks a little like the nursery with all the grasses. It is ashamed the nursery is closing. I would love to visit it, but never could anyway. There is a lot of design detail and attention to detail at this place. 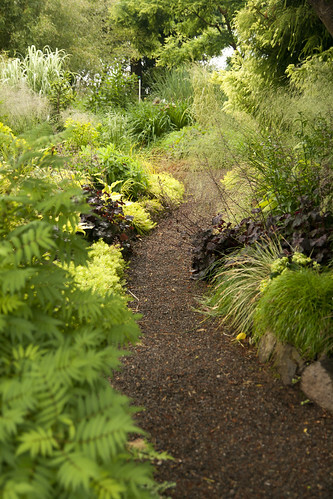 The gravel paths are a nice touch, aesthetically, environmentally and practically. I too like chartreuse and use the color often for real design punch. How sad to lose such a nice garden and nursery. Maybe they could get involved with the Garden Conservancy so the public can still enjoy the gardens? Will there be a going out of business plant sale? You will have room for more plants once you remove those euphorbias. What an AMAZING and Lovely post about my mother and her nursery. Thank you for the time and attention to my mom's life's passion. Red Heads To The Rescue!